Virginia scenic rivers. Source: ConserveVirginia. Click for larger image. The Northam administration has launched ConserveVirginia, a “smart map” that identifies 6.3 million acres of high priority conservation areas. 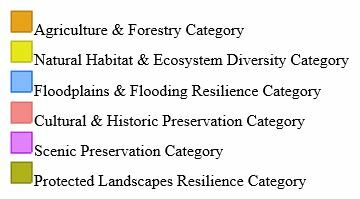 The map draws upon 19 data sets in six broad categories: agriculture & forestry; natural habit and ecosystem diversity; floodplains and flooding resilience; cultural & historic preservation; scenic preservation; and landscape resilience. The map provides a concrete tool for pursuing a land-conservation strategy Northam announced a year ago. Working with state agencies and partners, he said, the administration would prioritize protection of the top 2% of lands with the highest conservation value, with the goal of protecting the top 10% within ten years. Bacon’s bottom line: I have long called for prioritizing the issuance of $75 million a year in conservation-easement tax credits by preservation value, and I am delighted that the Northam administration views the expenditure of scarce state fiscal resources the same way. The ConserveVirginia maps looks like a useful tool in helping set those priorities. It’s not clear from the governor’s press release, however, which initiatives will be informed by the data. Will the maps be used to prioritize the granting conservation easements? Will the data guide the acquisition of lands for state parks? Will it inform the designation of scenic rivers and highways? Will it be integrated into land use planning? Or is Northam just articulating a vague aspiration? The press release is lamentably vague. Furthermore — and I concede that this is a quibble — the maps are of limited utility to the general public at present. They provide no color coding! The map above of scenic rivers, for instance, does not define the difference between rivers coded blue, yellow and green. The map below of “ecological cores” does not define the difference between red, orange, yellow, dark green and pale green. The mapping labels are easily resolved. The use to which the data will be put is quite another matter. I look forward to seeing concrete proposals. Whatever happens, assembling hard data and making it accessible to lawmakers, regulators, and the public does represent a step forward. Update: Carol Bova explains how a subscription is needed to access the full capabilities of the ConserveVirginia maps. This entry was posted in Environment and tagged James A. Bacon. Bookmark the permalink. “… Or is Northam just articulating a vague aspiration? The press release is lamentably vague. There is Bacon with another “quibble.” But here I agree, this is perfect map for Gov. Northham. Now he can change his stories & colors as he goes along. Thank you too Charles Winkler! Love your map with all its colors. But why the spill of red ink along the northwest border? Northam got plans for that spot? The Yankees causing trouble again? And where is the Fairfax Stone! And what’s difference between moderate and general? Right down Gov. Northam’s alley, I’d guess; keep them guessing, especially the boys along whole border with West Virginia, but got Atlantic Ocean right, anyway, but missing its name. In Jim Bacon's post, "ConserveVirginia Makes Preservation Data More Easily Accessible," he said "The maps are of limited utility to the general public at present. They provide no color coding!" They do, but there isn't any explanation about how--or why. The how is easier to show. The map is at http://vanhde.org/content/map and labeled "Virginia Department of Conservation and Recreation." The "vanhde" in the url is a reference to Virginia Natural Heritage Data Explorer. Anyone may access the site's map, but "A subscription is required to access additional sensitive Natural Heritage Resources data, and/or to use the site for project review.... a company, conservation organization or government agency looking for this service" must send a request saying how they intend to utilize the website and DCR's Division of Natural Heritage will decide whether to grant a subscription. What makes the subscription data "sensitive?" Why can't members of the public apply for a subscription? Is this a FOIA loophole where DCR doesn't need to share information with the public? Are instructions to access the color code legends subscription only? Clicking the "Map" tab opens the map to a disclaimer that says you must agree to three points to access the map. The data shall be cited "Virginia Department of Conservation and Recreation, Natural Heritage Program" as data source on any map or publication using DCR data and the date provided included. Although DCR maintains high standards of data quality control, DCR makes no warranty as to the fitness of the data for any purpose, nor that the data are necessarily accurate or complete. For Scenic Rivers, under Reference Layers, click Scenic Rivers. So the Lower Piankatank is qualified and the York and Rappahannock are worthy. The James River has sections that show Designated, Qualified, Worthy and no scenic category. From there, it's trial and error to see which boxes and + boxes will yield usable information. Under Conservation Planning, for example, in Mathews County, Recreational Model-Terrestrial indicates water areas like Hills Bay, Milford Haven, rivers and part of Mobjack Bay as "limited." Under Recreational Model-Aquatic, almost the entire land mass of Mathews is colored lime green as "abundant." Unless you consider aquatic recreation to be playing in flooded VDOT ditches or mud puddles on property near failed VDOT drainage, this is not very helpful. You will have to uncheck the ConserveVirginia Map box to see Forest Conservation Value areas. Overall, the colors are a little brighter in some categories than in DCR's previous conservation map used in former Gov. McAuliffe's 2016 Virginia Treasures program to get 1,000 properties into conservation. At first look, there doesn't seem to be any improvement in information accuracy. Yes, I encountered these obstacles too. These procedures to access these maps of Virginia felt like a state surveillance technique and exercise for a government under siege. As Carol knows her government maps of Virginia, and their weaknesses, better than anyone on the planet, she’d likely be a prime target. And threat to the State. Now too, we can add to “aquatic recreation” to the new found seas of steel and glass solar panels that recently have flooded Mathews County. So what is this all about? Why any press release at all? What a government! It acts like a bunch of UVA administrators. “Since 1989, the Virginia Department of Conservation and Recreation has dedicated its natural heritage staff to the identification, protection, and stewardship of Virginia’s biodiversity. To date, inventory has identified over 2100 conservation sites containing one or more rare species or communities. With over 45 employees dedicated to the preservation and stewardship of Virginia’s natural heritage resources, the Division has available the skills of biologists, ecologists, zoologists, conservation planners, environmental resource managers, landscape architects, and data managers. That being said, I had the the same problems and comments about the maps that Carol did. I assume that these are maps that DCR and its Natural Heritage division have created and use for their own internal planning and management. Unfortunately, someone in DCR’s central office or in the Governor’s policy office decided that the Governor could get some positive PR from releasing these maps and showing what a neat job DCR is doing. However, of course, they create more confusion than illumination. Reed , there is nothing nefarious going on, just some overeager staff members. Sounds like The Virginia Natural Heritage program could use a little help from the Garden Club of Virginia if the latter has not been blackballed and outlawed as racist. And, of course, such interactive maps of all sorts of resources are powerful and effective tools if used properly and imaginatively for example in planning and building the renaissance of the Shenandoah Valley to go along with the upgraded I-81, as only one of many examples throughout the state. These maps may be helpful, the lack of the coding info and general approach frustrated my attempt to use them. It’s hard to take seriously the call to protect land when land that was already protected was removed from protection for the pipeline. The “trade” is not what those who protected it wanted. As long as everyone knows that conservation is only until someone important comes up with an idea for using the land as they desire, I don’t think the public will support the efforts. Once again Governor Northam is trying to appear to care about the environment as he’s turning a blind eye to the permanent damage from the MVP I see out of my window and as I drive in my community and the similar damage I fear if the ACP gets to bisect my family farm. The damage the pipelines are already causing will make most stop and think. It’s too bad that so few people are visiting affected areas and seeing for themselves the magnitude of the damage. Was land that was in a conservation or farmland easement subject to seizure by eminent domain? From Richmond, where is the closest I can go to see the MVP damage?